The 2018 Awards were announced with Summit Principal Partner, Transport for NSW, represented by Deputy Secretary Clare Gardiner-Barnes joining hosts Lendlease at their stunning global Barangaroo headquarters overlooking Sydney Harbour. 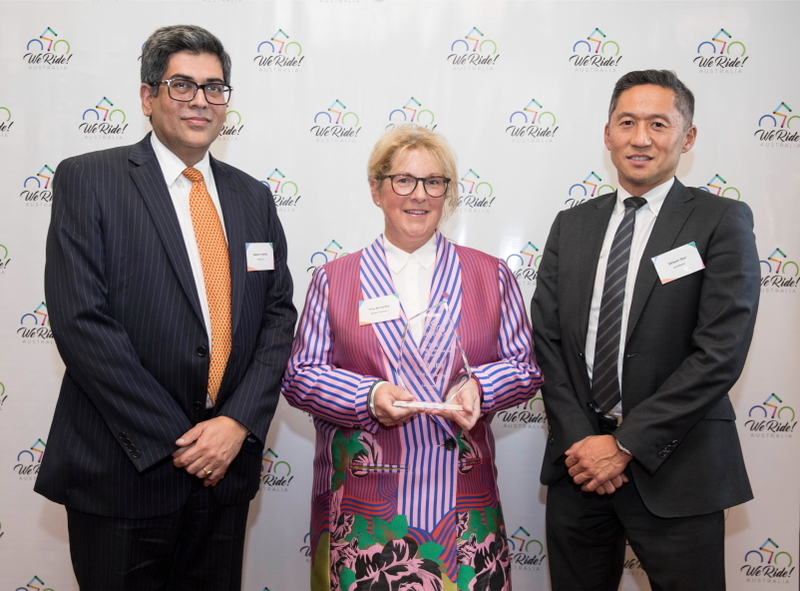 2018 AUSTRALIAN BICYCLE SUMMIT- Neelesh Mehta – Azur presents the Award for Leadership with Jeheon Son, Lendlease to Tina McCarthy Wheel Women at the Awards dinner, level 13, Tower Three, International Towers Sydney, Barangaroo, NSW. Photo: Jessica Hromas. Founder of Wheel Women Cycling, Tina established the concept in 2012 after finding that there were limited opportunities for recreational female cyclists to build confidence in the male dominated world of cycling. She is committed to empowering all women to ride and she has been a power house not just in the women’s cycling scene in Melbourne, but throughout Australia. She has developed a reputation for authenticity, honesty and realistic role modelling for female recreational cyclists of all shapes, sizes and ages. The 2018 Award for Leadership was proudly sponsored by Azur by Bikecorp. Sunshine Coast Council has embraced technology to develop an innovative tool to encourage students to cycle to school. RideScore is the first program of its type in Australia to record student cycle trips and provide real-time information to parents. The technology means that an email notification is sent to the parent when the student arrives at and departs from school. Students accumulate points for cycling to school that can be redeemed for prizes. RideScore provides peace of mind for parents of children who cycle to and from school. The 2018 Award for Bike Culture was proudly sponsored by FE Sports. 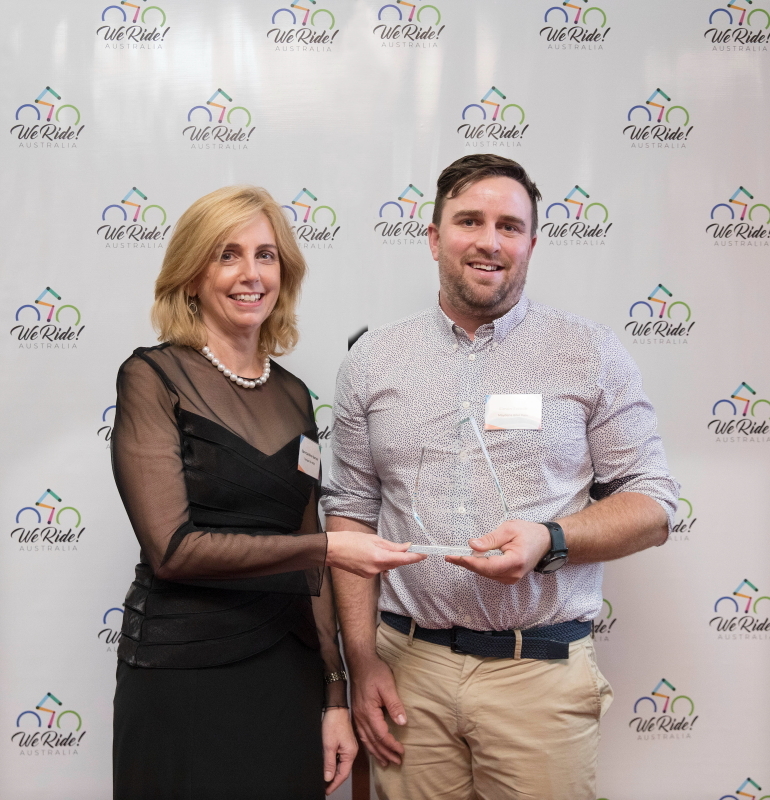 2018 AUSTRALIAN BICYCLE SUMMIT- Clare Gardiner-Barnes presents the award for For Built Enviroment to Simon French, Maydena Bike Park at the Awards dinner, level 13, Tower Three, International Towers Sydney, Barangaroo, NSW. Photo: Jessica Hromas. The Maydena Bike Park is a gravity-focused mountain bike park in Tasmania’s stunning Derwent Valley. Tasmania’s newest mountain bike park offers 34 World-class trails for everyone, from families through to elite riders. The development has repeated the experience of other successful MTB destinations with a doubling of the town of Maydena’s population on holiday weekends, increasing property prices and an economic boom transforming the fortunes of this regionally depressed local economy. 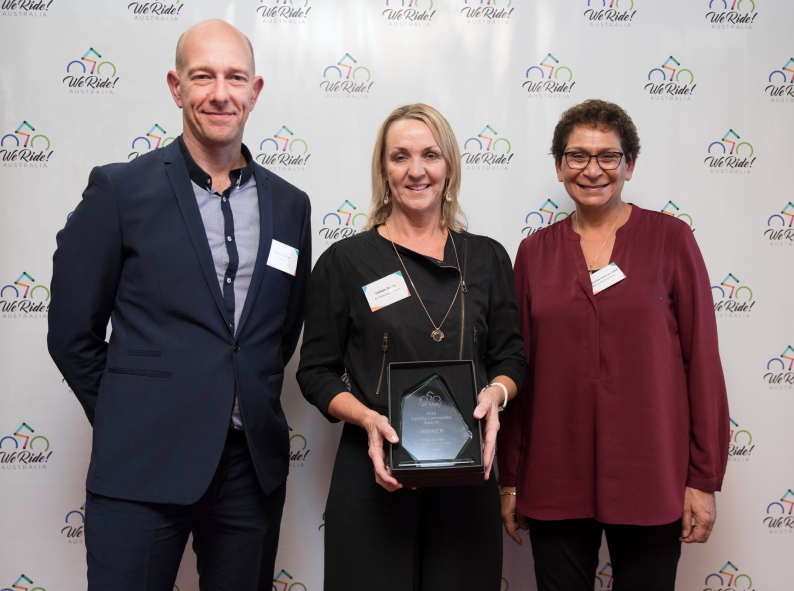 The finalists were selected from a pool of nominations from across Australia that included the people, places and programs that are making Australia a better place to ride a bicycle. Five of the nine finalists were women or recognise women within their organisations, two are regional organisations driving visitation, awareness and economic development and two more recognise local Council efforts to build better places in partnership with innovative developers and others.